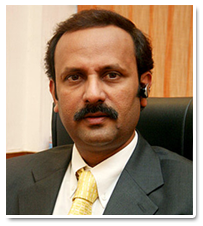 He is pioneer in Metallurgical Coke and Coal Industry in India and well recognized in the International arena. Mechanical Engineer from the Prestigious Madras University. He has undergone extensive training and exposure in architecture and landscaping. Has done Research and study for “Producing Hi-Quality Metallurgical Coke and selection aspects of Coals and its preparation”. Began his association with Ennore Coke Limited (BSE listed Company) part of US$ 15 billion Shriram Group as President & CEO in September 2007 and later became Whole time Director of the company. Within a span of one and half year, given a brand to the company in India as well as in the International Steel & Coke market. Become prominent in the industry ad presented several papers in the steel and coal conferences. Apart from commissioning his first plant, has made a tie-up with several coke plants for having contract manufacturing and increased the production facilities to 0.4 million MTPA and progressing towards 0.6 million MTPA within shortest time. He was instrumental for take over few running coke plants which were NPAs and converted into most successful units in India. Simultaneously been instrumental for take over two coking coal mines in USA and was converted into a success story in a shortest time. Sir Natarajan has presented many papers in a cross section of seminars and conferences on Steel/coal/Iron Ores. ICC’s India Invest Summit at Singapore and Eurocoke 2011 at Vienna and Chairman of 3rd & 4th India Coal Summit by ICC at New Delhi are one of the 40+ presentation to name a few in the last three years. Attended executive management program conducted by IIM, Ahmedbad, IIM, Kolkata and Administrative Staff College of India, Hyderabad. Have vast experience of over 46 yrs in vast spectrum of industries of copper refining, fertilizer, sponge Iron, beneficiation & pelletization, LNG project, oil & gas sector including implementation of grass route oil refinery project. Chief Executive Officer of a Refinery project in India of about US$ 1.0 Billion and dealt with International Engineering Companies and Consultants and Bankers & Financial Institutions for raising of Equity and Debt. Chief Executive Officer of 1050 MW Thermal Power project in Odisha of more than US$ 1.0 Billion. Academically qualified Graduate Engineer (Mech) / MBA (Finance) / M.Phil (Management) with distinguished career of over 36 years in leadership roles in the domains of service, sales, marketing and overall corporate operations, with country's premier machines tools /watch manufacturing company in Public Sector. Last assignment has been as Managing Director with HMT Watches Ltd with final accountability to drive company's resources to acquire competitive position and achieve reasonable returns to ensure business continuity. Core competencies in defining business mission, delineating corporate objectives, contributing policy inputs, setting up work flow systems and balancing engagement of resources to realize the mission / business objectives effectively and efficiently. Creative aptitude with strong track record of introducing several strategic systemic improvements / innovations to strengthen market presence. Prolific relations builder with ability to acquire and retain continued patronage of high profile accounts. Strong credentials in setting up effective liaison with Ministries / Regulatory authorities to secure needed support as and when needed. Articulate and assertive with ability to lead large multicultural teams and integrate their efforts to achieve organization's objectives. An effective trainer, motivator and administrator having ingrained strengths to transform mediocre assembly of people to cohesive team of performers. Superior drafting, communication and administrative skills.